Idaho became a state July 3, 1890, the 43rd state admitted to the Union. French trappers named this area along the river Les Bois (The Woods). Appearing as an oasis in a high-desert area, the cottonwood trees growing along the riverbank served as a distinctive landmark. 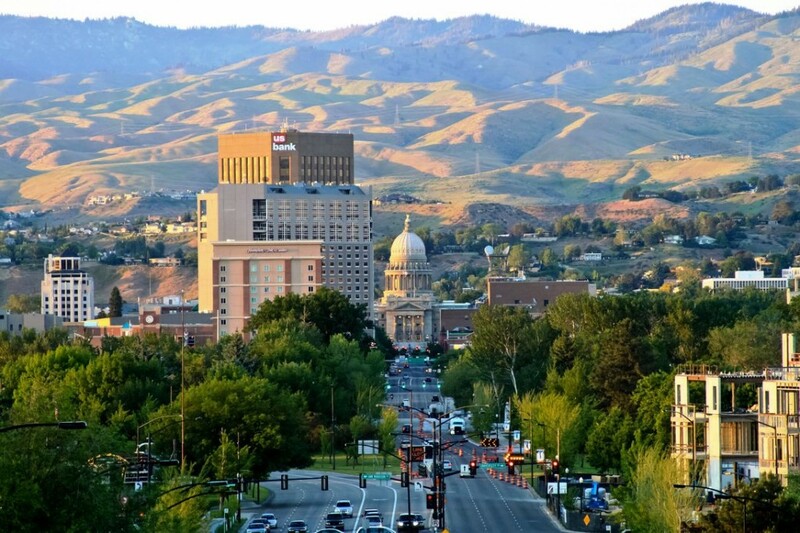 Today Boise (BOY-see) is Idaho’s largest city and capital. The neo-classical capitol, completed in 1922, is faced with Idaho sandstone and filled with murals and exhibits showing the state’s past. Boise is home to the largest Basque community in the United States. Boise State University is located here with a beautiful riverside campus. The World Center for Birds of Prey has breeding chambers for California condors and other raptors. The State Historical Museum has 10 different historical interiors such as mining, fur trading, forestry and ranching. At the Old Idaho Penitentiary visitors may see penal methods of the 1870’s. Eagle Island State Park is 546 acres between the north and south channels of the Boise River; Boise National Forest is 2,646,341 acres containing the headwaters of the Boise and Payette rivers, and offers access to the Sawtooth Wilderness and the River of No Return Wilderness. Bogus Basin Ski Resort offers night skiing all winter long. The vastness of the open hills, the closeness of the neighborhoods, the loving focus on the out-of-doors. The well-used parks, the river that’s revered, the cottonwoods and all the trees. Les Bois! Mountains near: Owyhee, Rockies. Borah Peak, in the central part of the state, is the highest point in Idaho at 12,668 feet.